PHP Tools natively support the Twig template engine since version 1.25 in Visual studio 2015 and newer. PHP Tools seamlessly integrate Twig support into the Visual Studio using the same shortcuts, commands and menus as the other languages. The Twig support is built into the system and its features do not require the Twig engine to be installed in the project, but some features provide additional information when it is present (detailed information is provided for each feature). Twig can be installed either via a composer package (directly available in the PHP Tools) or its source code can be directly included into the project. PHP Tools provides syntax highlighting for Twig templates. The colors follow the Visual studio color scheme and support Visual Studio themes. Syntax highlighting does not require Twig to be installed. Twig syntax highlighted for a short template. PHP Tools provides complete syntax validation for Twig templates. The syntax analysis reports all the syntax errors, as well as some of the errors reported by Twig runtime during rendering. This feature helps to create valid Twig templates and avoids common errors. Syntax error in a Twig template (filter used without separator |). Built-in filters (requires Twig installation). User defined filters (declaration must be part of the project). Variables defined in PHP (both global and local). Variables used in Twig template (variables used in the currently edited template). Tooltip for the built-in filter upper. Variables previously used in the Twig template (variables used in the currently edited template). Completion list for the word upp with the built-in filter upper selected as best match. Built-in and user defined filters. Variables defined in the Twig template (variables used in the currently edited template). PHP Tools highlighting all the occurrences of the worlds variable. Twig outlining used to collapse the test macro, a tooltip shows the body of the macro. Twig SplitView highlighting and navigation. Construct completion used on a Twig for loop. User defined filters (PHP functions added to Twig environment using $twig->addFilter($filter);). Global variables defined in PHP (defined using $twig->addGlobal('name', $value);). Template-local variables defined in PHP (defined when rendering the template $twig->render('template.twig', array('value'));). Completion suggestion for a user defined Twig filter. 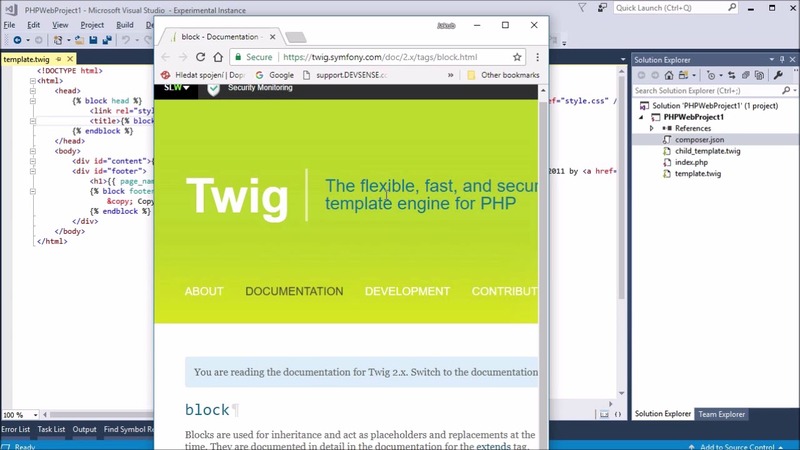 The PHP Tools Twig editor is automatically used for templates with the .twig extension. It has to be manually opened for the templates with other extensions. This is done by right clicking the template file in the Solution Explorer and selecting the Open With... command. The command opens the Open With dialog, where it is necessary to locate the Twig Template Editor, select it and click OK.
PHP Tools Twig editor used to open a template with a custom extension. Twig can be installed either via a composer package or its source code can be directly included into the project. PHP Tools provides an information bar whenever a Twig template is opened without the Twig template engine installation. It allows users to seamlessly install the Twig composer package, simply by clicking on the Install now link. The bar disappears once Twig is installed. The bar can be closed either once or forever by clicking the appropriate button. Twig information bar displayed when editing a Twig template without a Twig installation.